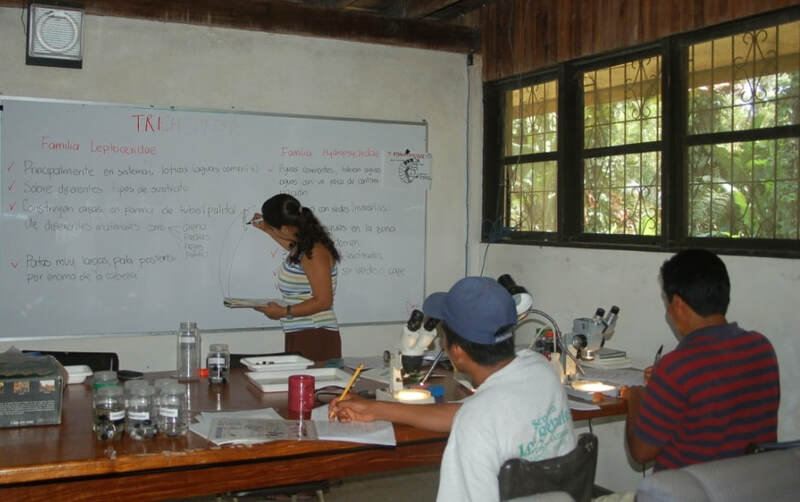 The group formally known as the Red Multicultural de Bioeducadores de La Amistad Caribe, or simply "bioeducators" received its initial impetus in 2004 when we were asked to do 2 workshops on aquatic biodiversity issues for leaders from Panamanian indigenous (Ngobe and Naso) communities. Part of the course consisted in identifying fish in the field, and some of the students displayed outstanding aptitude and interest. This caused us to think of enhancing our own work by developing a citizen science component built around a cadre of "parataxonomists" (think paramedic or paralegal), a tactic pioneered in Costa Rica by INBIO. This coincided with our development of IBIVI (Visual Index of Biotic Integrity) - the first fish-based biotic index which does not depend on capturing samples of fish. As it turns out, the experience and capability brought by the trainees accelerated the development of IBIVI, which was finalized in 2008. (See the section on Biomonitoring Methodology ) We also provided training in benthic macroinvertebrate identification, use of the SVAP habitat index, general concepts of stream ecology and report preparation and presentation. What began as a Panamanian project was extended into Costa Rica, and the current Bioeducators group includes members of all 4 indigenous ethnias in the region (Ngobe, Naso, Bribri and Cabecar) spread across the La Amistad Caribbean watersheds from the Rio Chirripo Atlantico at the western extreme, in Costa Rica to the Rio Changuinola at the opposite end in Panama. 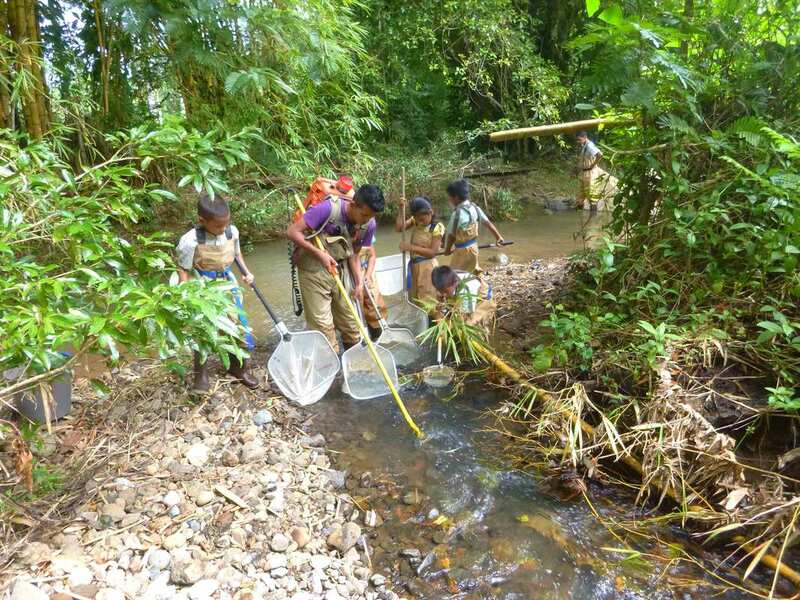 The original idea was (and remains) for the members of the group to produce a multiplier effect by carrying out independent assessments of stream health, especially in the remoter reaches of the indigenous territories where it is costly and time-consuming for us to visit regularly. However members of the group spontaneously took on other functions. In some cases these functions flow from particular skills and interests possessed by the members. For example: Esteban Romero (Costa Rican Bribri) is a talented artist and has done many illustrations for ANAI courses and presentations. Marcio Bonilla (Panamanian Naso) is also an accomplished artisan and contributed an 8 ft. long wood carving, illustrating the scientific concept of "River Continuum", which adorns the wall of our Hone Creek field office. Yahaira Barquero (Costa Rican Cabecar) had already chosen to study to be an educator and immediately plugged into our Environmental Education Project. * Expansion of our Environmental Education Project into the schools of the indigenous areas, independently and as assistants to Maribel Mafla. 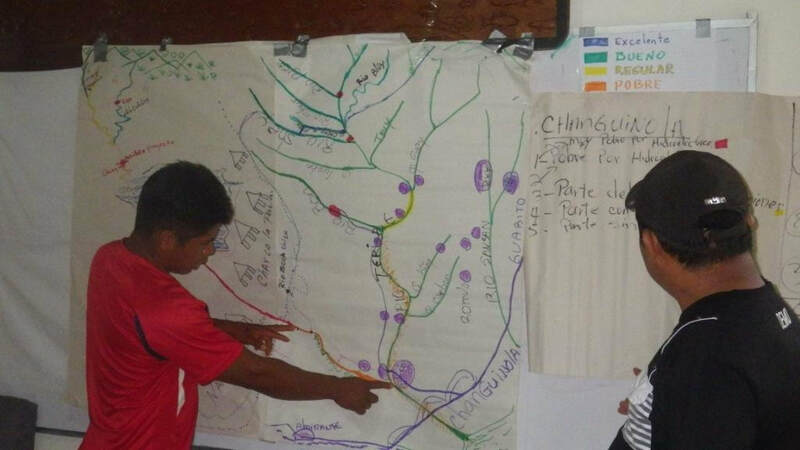 In 2018, for the first time we will offer educational experiences in the elementary schools of the indigenous and non-indigenous communities of the Changuinola/Teribe and San San watersheds in Bocas del Toro. Bioeducator Marcio Bonilla was instrumental in developing relationships with school directors in the indigenous areas and in the process of securing approval from the Panamanian Ministry of Education. * Presentations on river health and the concept of biodiversity for indigenous governments and community groups. In addition, Bribri bioeducator Jairo Sanchez was the lead presenter in a series of programs on watershed and aquatic issues broadcast over the indigenous Voz de Talamanca radio station, based in Amubri, Costa Rica but heard throughout the indigenous communities of the binational La Amistad area. * Representing both the indigenous position and the biological consequences of dams and other megaprojects at local, national and international forums. Especially notable here are attendance and presentations by bioeducators during the several visits by UNESCO missions to deal with issues around the La Amistad World Heritage Site. We would also note a memorable presentation by Naso bioeducator Hugo Sanchez at the 2011 congress of REDLAR (Latin-American Dam Network) which has had ripple effects far beyond the La Amistad region. * Documenting the decline of diadromous fish and shrimp above the CHAN-75 and Bonyic Dams in Panama (constructed in 2011). As of 2017, this effort is going into high gear under the leadership of Marcio Bonilla and with the participation of Ngobe bioeducators Celio Abrego and Eliceo Quintero. Results will be folded into the growing body of work arguing against high dams from a biodiversity conservation standpoint. * Assisting in the development of biomonitoring programs in areas beyond ANAI's service area. For example Cabecar bioeducator Benjamin Soto had a lead role in providing onsite training for biologist Dra. Rocio Rodiles, who directs aquatic research programs for Colegio de la Frontera Sur in Chiapas, Mexico. * Recruitment and training of new bioeducators, especially young people. At any time, 4 or 5 individuals from throughout our service area are undergoing training. 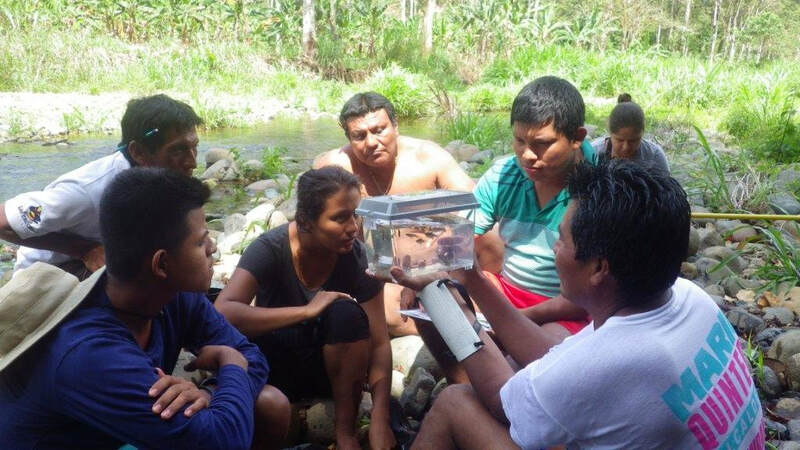 While given the logistic difficulties presented by our binational area, we often find it prohibitive to offer formal courses at our Hone Creek facility, we now find it possible to cut costs by initiating training in a trainee’s home community/watershed, and letting established bioeducators do much of the follow-up. The formal name came about during the first meeting of the group at which it was decided that the term "parataxonomist" was too limiting. The group settled on "bioeducator" as best describing what they wanted to be and accomplish. They elected to not formalize the group, feeling this would drain resources and that there is already an excess of incorporated groups in the region competing for available funds. The various members also function as farmers, ecotourist guides, artisans, teachers, students . . . This leads to a certain degree of fluctuation in active membership. Overall, 25 individuals have received full bioeducator training, and various are in stages of apprenticeship. Essentially bioeducators are "on call" according to needs identified by their communities or the ANAI program. A major limitation is financing. We do not see "bioeducator" as a full time job description, but we would like to provide more employment than we can. A reasonable goal is to be able to offer each bioeducator 50 days of paid work annually. Until we achieve that goal we will not have achieved the potential of the most powerful community involvement tool we have yet devised.